One of the coolest things about gardening is that you get to try again each year. However, it does mean putting your garden to bed after you’re done for the year. Just before I left for Maine, I put Showcase 2 and my Ranch Community Garden beds, well, to bed. This is something that every gardener should do, but it’s more important in places like Colorado where the temperature fluctuates quite a bit and the humidity goes from dry to very dry. I like second chances. I really like second chances. Pretty ‘taters. There were four varieties this year. that, I may need to water them a couple of times if the winter is dry again, but that’s it. I had planned on buying fancier garlic, but I can always do that later. You can plant it pretty much any time during the winter that you can work the ground. In the meantime, at least I know I’ll have something coming up in the spring. Step three- mark anything that will need attention over the winter, like my garlic bed. I planted them in the potato bed thinking only of crop rotation, not that the soil was already so conveniently turned. Really. Step four- cover with straw or some other mulch. This serves three purposes. 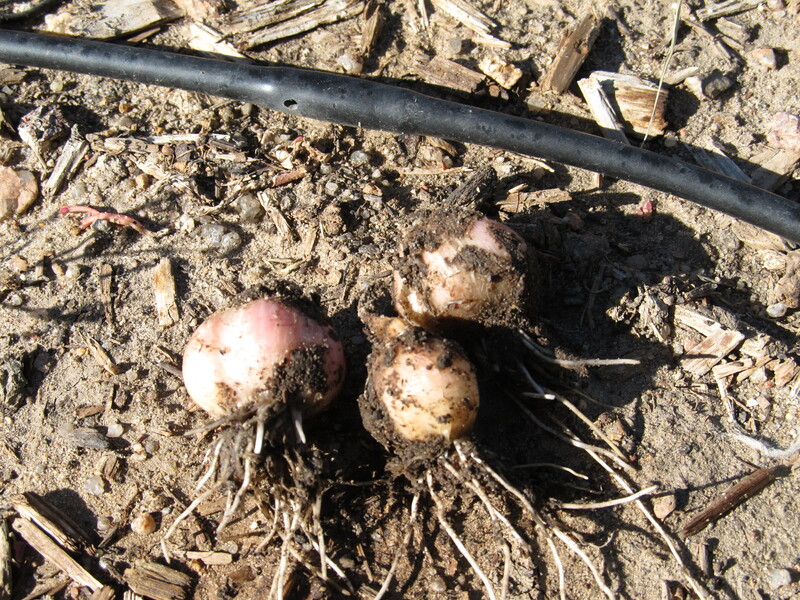 First, it holds the temperature of the soil more even than it might be otherwise. Best case, it keeps it frozen all winter. For things like rose bushes, they aren’t wrapped and mulched to keep them from freezing, they are wrapped to stop any freeze/thaw cycle you might get through the winter. In the case of my soil, keeping it frozen keeps the microbes dormant. Second, it keeps the soil far more moist than it might be otherwise. This is particularly important in places where our wet season, winter, is a dry season by most standards. Third, both sets of beds could use more organic material for building them up. A little while before planting next spring, I’ll dig the mulch into the soil for it to complete the breakdown into usable bits for my plants. Keeping my straw in my bed and not in the path. I would like to note that if you don’t know the difference between straw and hay, make very sure you ask for a straw bale. Straw is what is left over when you harvest wheat and oats. Since wheat and oats are seeds, they are going to make sure they take all of the seeds before they bale what’s left. It also has very few weeds to supply seeds. Hay, on the other hand, can be anything from prettily-groomed alfalfa (seed-heads attached) to whatever is growing in that meadow over there that didn’t fall out when I baled it. It’s also usually more expensive. If you’re not sure what you have, straw tends to be pretty golden in color, while hay should be more green. You can probably also see seed heads and different types of plants in a hay bale. That looks so much better, now. Going back to keeping my microbes dormant, there was a small difference between how the two sets of beds were handled. My RCG beds had very low nitrogen. This is, essentially, normal. Nitrogen washes out of the soil pretty easily, so if you’re not replacing it one way or another, you probably won’t have much. Showcase 2, however, really had way too much. If the microbes wake up during the winter, they just go about their usual tasks, which includes eating up nitrogen in the soil. Therefore, the RCG beds were put away a couple of weeks before Showcase 2 and they were given a sprinkle of bloodmeal under the mulch. Because nitrogen washes out, you don’t want to add much, if any, in the winter, but it will give me a jump start on what needs to be added for next growing season. It will also keep the microbes happy and breeding for me if they do wake up. I left Showcase 2 until the last minute, hoping that the microbes would use up some of the excess nitrogen for me, so that we could have more balanced growth next year. Putting my beds to bed turned out to be more than just a chore that needed to happen before I could go on vacation. I actually feel better now. I know that summer is over, because the gardens are put away. We spend so much of our lives being places and doing things that don’t change with the seasons that I had started to not notice when one season became another. I didn’t need to, really. I think that’s a mistake, though. Anything that lives and dies has seasons, and ignoring that couldn’t possibly be for the best. As Pete Seeger tells us, to everything there is a season. There’s got to be a reason for that. Healthy by almost anyone’s standards. Ok, so I’m a little late on the Thanksgiving post. I think I have a legitimate excuse, though. This is my first holiday in Maine in, well, years. Aside from the big day itself, I’ve been spending time visiting with family members I haven’t seen in an age. I was also helping out with the cooking. Cooking for people, after all, is so much more fun than just cooking for yourself. All of this makes sitting down to put together a post on the back burner. The diet starts . . . tomorrow. Going home always includes traditions. I have been to several different family’s Thanksgivings over the years. 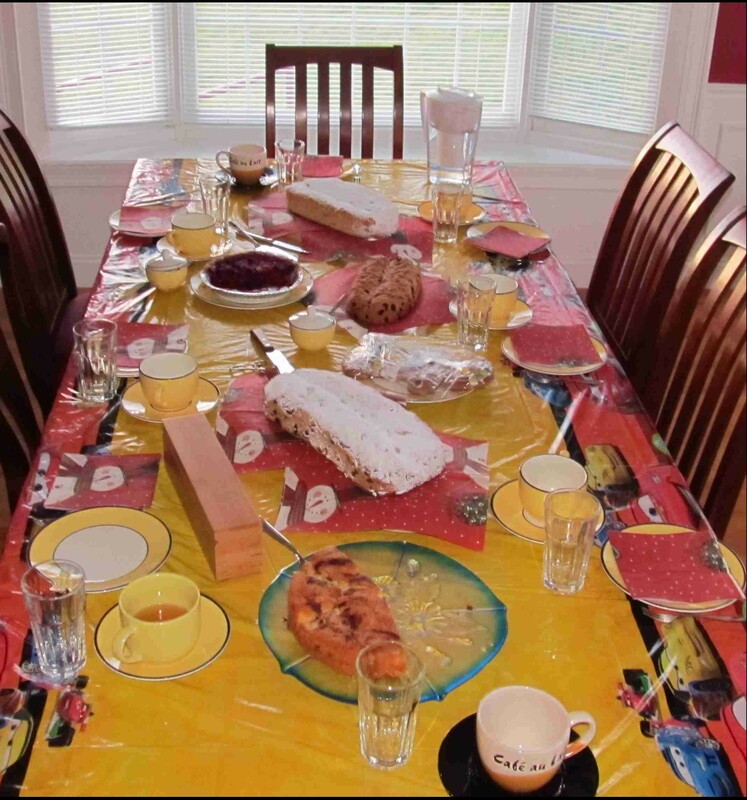 Each have their own traditions, a buffet, a small family gathering, the first Thanksgiving cooked by the husband. 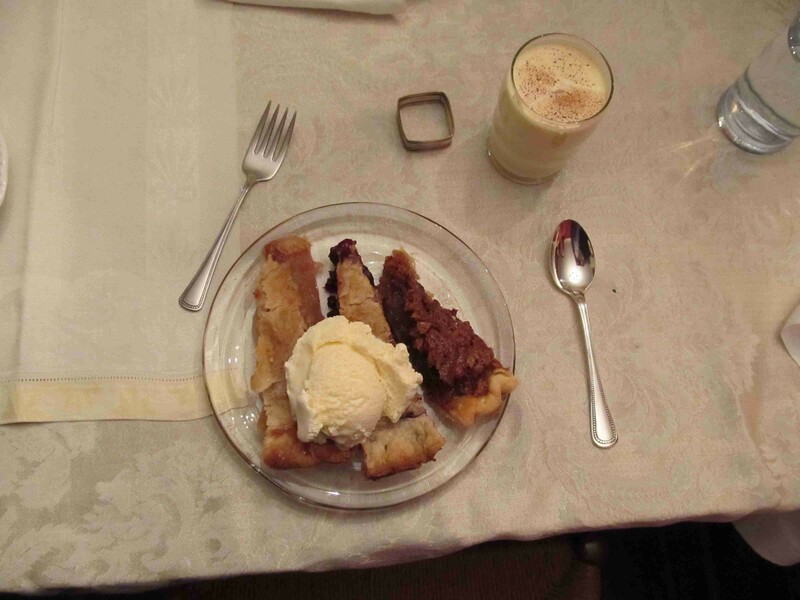 It was really, really nice, though, to go home to the traditions I grew up with. 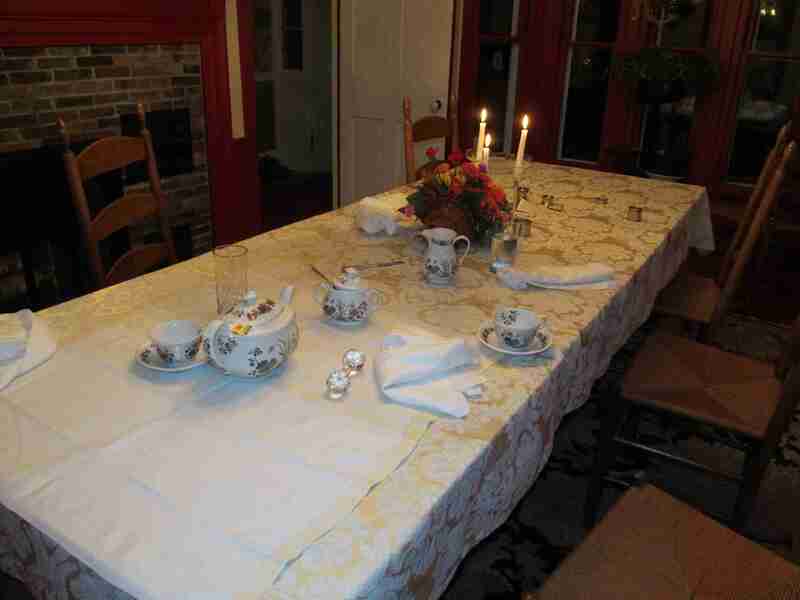 I was setting the table, so I got to pick the china we used. It was Mom’s from her wedding. The same china that we always used for both Thanksgiving and Christmas dinners. We had shrimp cocktail that, as it has forever, disappeared with remarkable swiftness. I wasn’t part of a line of kids making the stuffed dates, but they were still part of the appetizers. 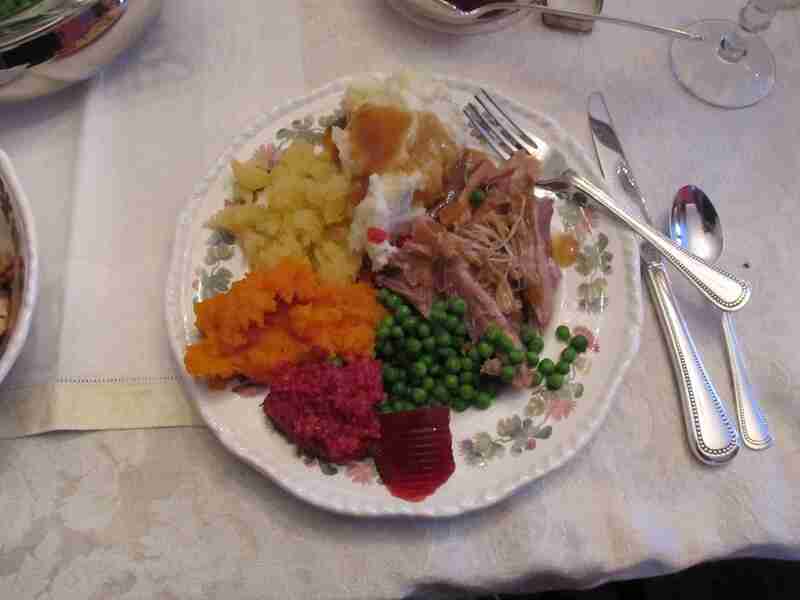 When we sat down, Dad carved the turkey at the table and we passed around dishes of fall vegetables, many from the garden out back. Even the turkey tasted right. There is nothing quite like a bird cooked on a charcoal grill. Marrying a German into the family is a great idea! After Thanksgiving, we got to go visit a cousin who’s family hadn’t made it up to Maine for the big day. I also got to spend time with two of my three siblings, discussing their current projects and visiting my brother’s. We did not grow up near our grandparents and cousins, so moving to Colorado didn’t mean leaving my entire extended family behind. I am slowly realizing, though, why people don’t move away from their family. Whether you get along with them or not, no one knows you like they do. Did you get to go home for the holiday, or are you the people that others come home to? Have you noticed your traditions recently, or are they just something that happens? This year, I think I’m thankful that I have family and traditions to come home to. Today’s weather might not show it, but we’ve already had our first snow of the year. Summer is gone and I’m not quite sure where I put it. Unfortunately, my absence here has been mirrored by my absence in the gardens under my care. What should be a good season for me is just going to be filed under “best not to think about it.” However, it hasn’t been a complete loss. I did get to compare what happened with two completely neglected gardens. Daggone it. I can’t believe I missed the tomatoes. Showcase 2 was to be hand watered. I had two four-by-sixish plots and the bean plot that was to use the dead bush as a trellis. To be honest, watering that much ground on a daily basis to the extent that it needed to be watered is boring. Showcase 1 is hand-watered by the owner, but it is smaller. She is also more conscientious about it, so it worked for her. In the end, Showcase 2 gave us some very small potatoes. Literally. There were also a handful of tomatoes that had to be ripened in a paper bag because the frost came before they were ready. 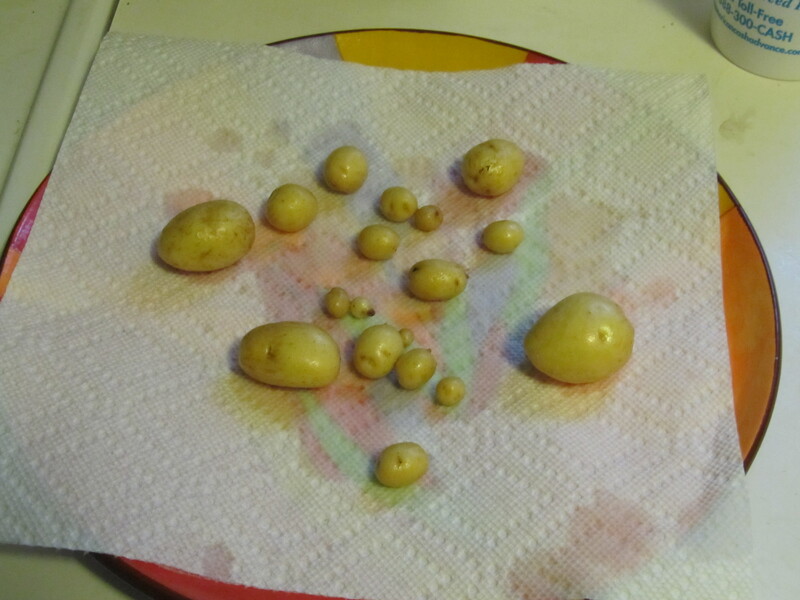 To be fair, part of the problem with the size of the potatoes was the very, very high nitrogen content in the soil. That should be better by next year. The problems with everything else that got planted can be pretty squarely settled on my shoulders. They’re bigger than they look. 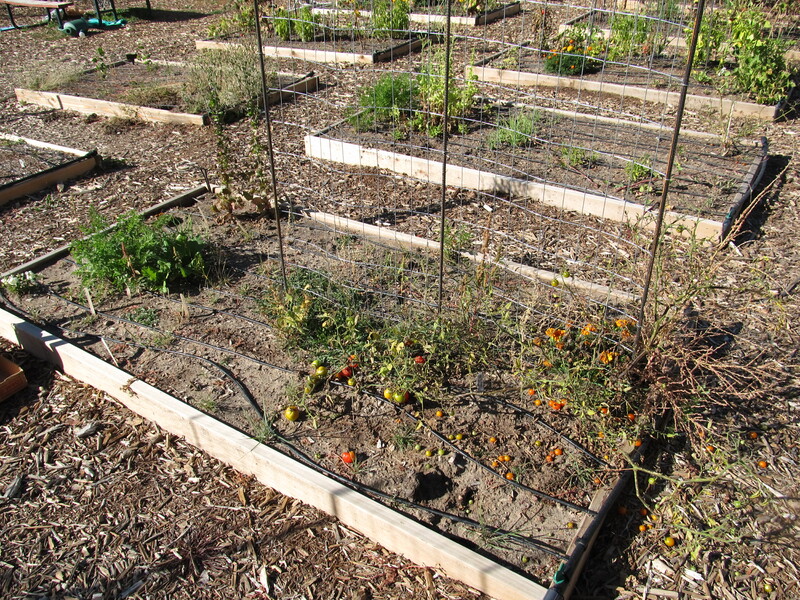 As for the Ranch Community Garden beds, they fared better. At one point, I did not set foot in the garden for over a month. Which, by the way, is bad manners, so don’t do it yourself. 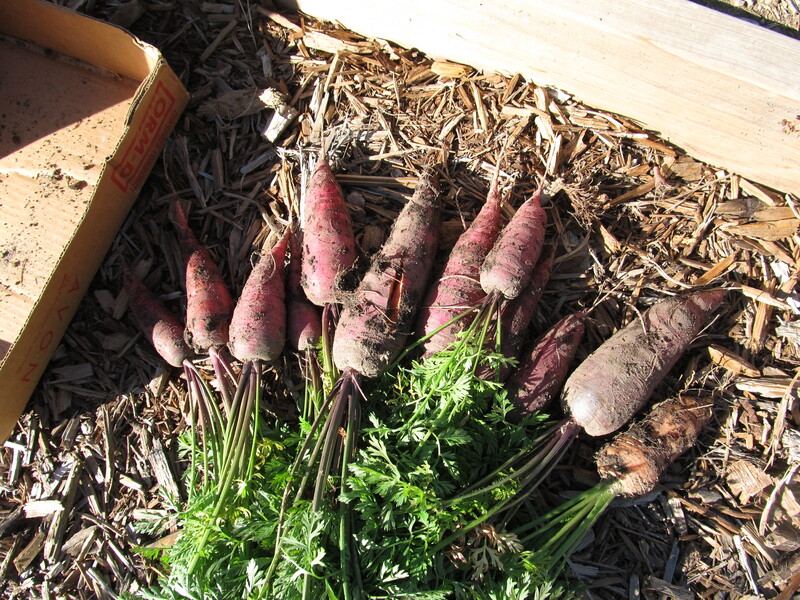 However, they yielded some enormous carrots, some very tiny garlic bulbs, and some not-unusually-sized turnips. I even would have had tomatoes from the vine if I’d paid any attention whatsoever. Why the relative bounty? Those beds were watered every night automatically. It was on the light side to avoid over-watering, but they did get it. In parts of the world where moisture is not a problem, this might not sound like such a big deal. However, around here, it is. Everything is dry around here. What little moisture comes out of the air is sucked up by plants, soil, and eventually the air again. Unless you’re growing yucca and sage, you probably need to supplement the available water pretty heavily. Turns out you can plant garlic in the early summer. If you’re ok with the whole bulbs being the size of a regular clove.